SKINS CYCLE DNAmic Bib Half Tights are the perfect training partner to get you further, faster. 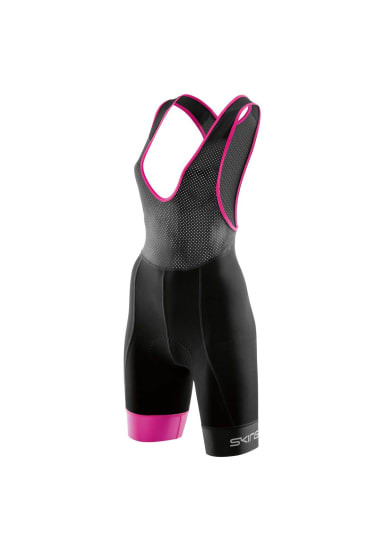 Combining SKINS best compression with a three-dimensional Elastic Interface Technology premium chamois, eliminated seams in the inner thigh to reduce friction, and a silicone gripper in the hem to keep your tights in place, they’re designed for comfortable, hassle-free rides. Pair the SKINS bib shorts with their CYCLE Jersey Classic for an on-bike combo that’s designed to go the distance. The three dimensional Bastogne HP chamois provides the perfect fit and saddle stability. It offers increased protection with wide ischiatic and perineal foam specially shaped for the female anatomy. High density, perforated foams maximise breathability and are applied underneath for a comfortable, flat surface with close and continuous skin contact. It's the perfect women's chamois for long rides. SKINS proven 50+ UV protection in non-mesh areas.